In the outskirts of Nara, the last bits of spirit is leaving of Nara Dreamland, an abandoned amusement park. It closed in 2006, after its number of visitors dropped dramatically in the opening of the new Tokyo Disneyland, as well as the more recent arrival of Osaka Universal Studio. The Nara government is demolishing Nara Dreamland very soon, to get some more space for parkings and such. So I went to pay my visit as soon as possible. Then in the following morning, I still ended-up jumping crazily over the fence, as there seemed no any other way.I have to get in! After all I did not came all the way for nothing! After a short walk though the bushes, I arrived at Nara Dreamland’s official entrance. Welcome to the wonderland! I can already fell that this is going to be an extremely good one, even though I was a bit worried. Some kind of security is supposed to be working here, and urban explorers have been caught many times in this place. Most people came here by night, but I really want my daylight pictures, so… that’s it. Dreamland was build in 1961, six years after the original Disneyland. The inspiration for this park actually came entirely from Disneyland, they even have exactly the same layout! Let’s visit it. The main avenue really looks like Disneyland, with the Cinderella castle at the end. All the shops and restaurants are empty, but there are still tables and chairs inside. A real ghost town, to start with. Mmm, it seems there was also a Ghibli shop, called “My Neighbor Totoro”. Wait! 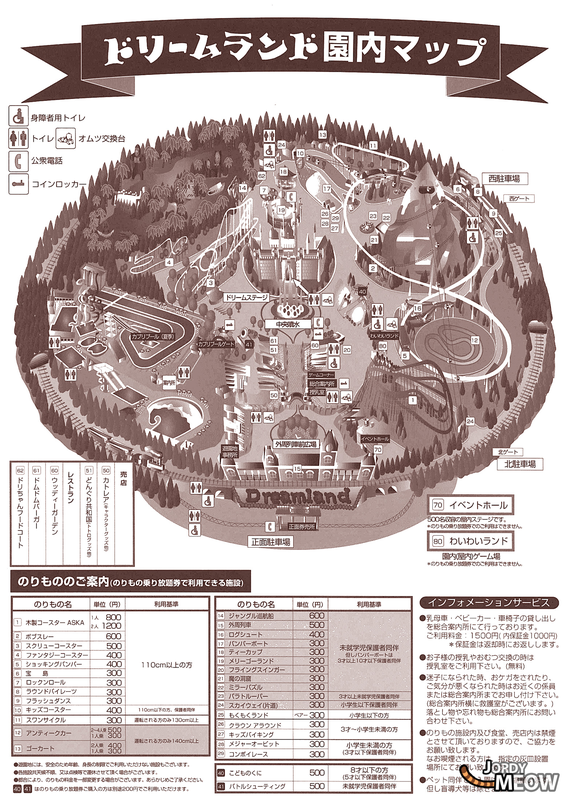 There’s a map of Nara Dreamland on the floor. Here it is! I’m going to the center of the park now, in front of the castle of Cinderella. There was no Mickey around, but there were two original characters whom can be found everywhere in the park. A sign told me that they were called Ran-chan and Dori-chan. This is actually the access gate to Fantasyland. But first, let’s go on the left, to Adventure Land ! A wave pool and many standard water attractions can be found here. Information board said the park was looking for summer time staff, with a salary of 900 yen per hour, just to watch some Japanese girls wearing bikini. From the top of this attraction, we could get a magnificent view of the entire park with the roller-coaster in the back. At the same time, it was really easy to be spotted from here. Better to go down quick. Then, not far from them, the Screw Coaster. It is probably the second best attraction of the park, certainly one of the best subject to take pictures of. And don’t miss the haunted house! Tomorrowland is the modern section of the park; with video-games, attractions accompanied by loud music in the background. The noisy but very fun Flash Dance. And more interestingly, its woody roller coaster! Here is Aska, the most famous attraction of Nara Dreamland. Its name comes from Aska, a neighbor city of Nara which was a former capital of Japan more than 1500 years ago. The praises of this roller coaster are common and recurrent on the Internet. Thus it is amazing to see it being left behind, slowly taken over by the plants. The woody rollers-coasters have an advantage over the ones made of steel: they shake more. Also, they make sound like a big monster which makes it even more interesting and impressive. I would have loved to try this one! They are getting rare so the cost of maintenance must be very high. That’s it for now. The sun is too high, so it is better to leave now. But actually it was way more difficult to get out than to get in. There were too many people around the park, plus the guard must be high on coffee and vitamins with his eyes wide opened now. I therefore jumped and run very quickly ouf of the park, never looked back, jumped into my car and drove away. That ended my aventure at the city of Nara. Update: I lived in Nara for one year, went back to Nara Dreamland 20-30x more, so I have two articles more about it. The Abandoned Roller-coasters of Nara Dreamland and Nara Dreamland: The End of a Dream.